Norway visitors can now experience the beautiful Scandinavian destination from an all-new perspective with the anticipated opening of the Loen Skylift. The unique cable car experience, opened in May, begins in Loen, a charming village in the Nordfjord region, about 120 miles northeast of Bergen and 200 miles northwest of Oslo. 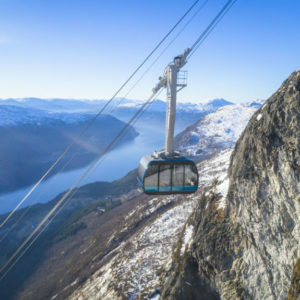 Named the world’s steepest aerial ropeway, the Skylift will carry visitors more than 3,300 feet up to Mount Hoven in about five minutes, providing panoramic views of the surrounding scenic fjords, mountains, Loelva River and Jostedalsbreen National Park. The lift will operate year-round, offering unique perspectives each season, and is expected to transport more than 40,000 visitors in its first year of operation. It also provides easy access to Mount Hoven’s marked hiking trails, climbing routes and winter sports terrains in addition to fine-dining spot Hoven Restaurant, located at the summit. The Skylift is located next to the Hotel Alexandra in Loen and runs continuously throughout the day. Each cabin holds 40-45 people, and there is no minimum age limit to ride the lift. A ticket costs about $57, but is well worth it for the breathtaking views.